Now patients who are missing teeth have a strong, beautiful alternative to bridges, partials, or full dentures. Dental implants will improve your smile and your lifestyle. They look, feel, and function like natural teeth because of a titanium anchor attached to the jawbone. Dental implants can also anchor bridges, partials, or full dentures to eliminate slipping. Dental implants offer a strong, fabulous alternative to bridges, partials, or full dentures. They can renew your smile and improve your quality of life. A dental implant consists of a titanium post anchored to the jawbone that holds a prosthetic tooth in place. With a false root and crown, a dental implant closely mimics nature in appearance and strength. After a thorough evaluation, Dr. Lalonde can tell you whether you're a candidate for dental implants. They require adequate bone structure for placement. The first stage of the procedure involves oral surgery in which a titanium post is implanted into the jawbone for each missing tooth or for the new teeth that will anchor a bridge or denture. Nature will take its course, allowing your bone tissue to fuse with the titanium post. This creates a solid foundation. During the first part of the procedure, we will position the small titanium post into the socket left by your missing tooth. After your bone fuses with the biocompatible post, Dr. Lalonde will permanently attach a handcrafted porcelain crown. The final restoration looks completely natural and blends with your remaining teeth seamlessly. By imitating an entire natural tooth, from the root up, dental implants offer a prosthetic that closely mimics nature. The result? Dental implant patients enjoy restored function, which allows a healthy diet of hard-to-chew foods. Speech may also improve. Strong and secure, your new smile will boost your confidence, enhance your appearance, and improve your quality of life. You'll enjoy the foods you love again – even steak - and smile with total confidence. Schedule a consultation with Dr. Lalonde to discuss whether you are a candidate for dental implants. 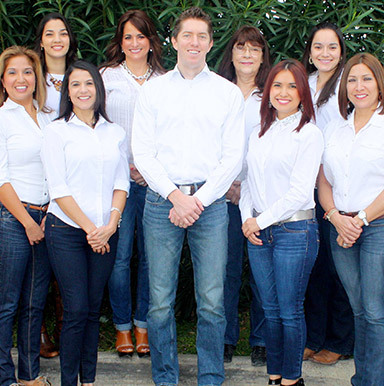 We welcome patients from Brownsville, South Padre Island,Port Isabel, San Benito and Bayview to our Los Fresnos dental office.